Ben Thompson insists he’s moved to Pompey to win another promotion from League One. The centre-midfielder arrived at Fratton Park on loan from Millwall for the remainder of the season last week. And the 22-year-old has made an impressive start, displaying his quality in victories over Oxford United and Bristol Rovers. Thompson knows what it takes to reach the Championship. 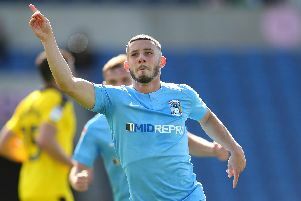 He made 38 appearances when the Lions won promotion from the third tier via the play-offs in 2017. The Sidcup-born ace also featured in the final when Millwall were beaten by Barnsley at Wembley the previous year. Thompson revealed he joined Pompey to feed his habit of playing at the national stadium. And, based on the Blues’ perfect start to the season, he sees ‘no reason’ why Kenny Jackett’s men can’t achieve that. Thompson said: ‘I was very impressed with Jamal (Lowe) against Oxford. He’s a great player. ‘Tom Naylor is a great centre-midfielder. I played against him when he was at Burton. I really do think the squad can be promoted. ‘I’ve come in, watched the boys and played with them. ‘There’s no reason why we can’t get out of this league with the ability of some of the players and football being played. ‘In the two campaigns when I’ve played a lot of games, I’ve been to Wembley twice and played in a play-off final.